it's unlikely you'd find a vinyl-wrapped edge st with a nearly 1,000-pound camera crane at your local ford dealer. (if you do, see if you can score zero percent financing on it.) but north hollywood, calif.-based pursuit systems, a company that builds equipment for movie and tv studios, made it happen. 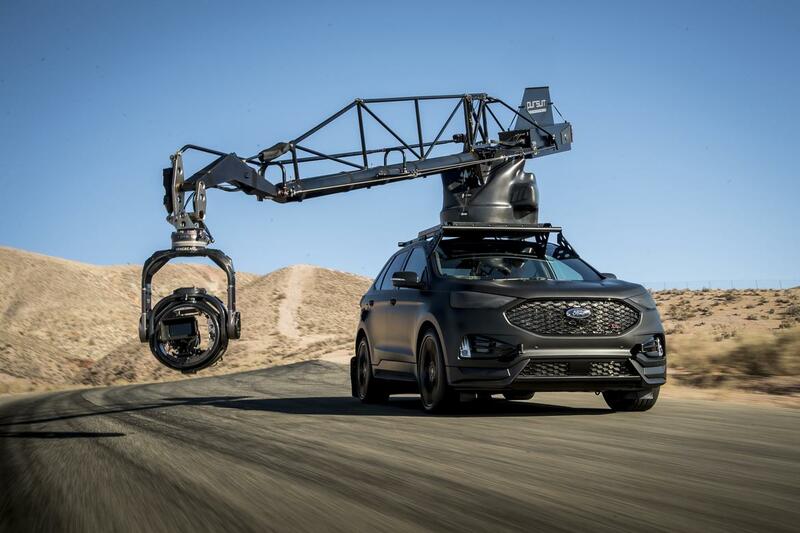 the company's products include a roster of retrofitted vehicles to aid film production — among them the mercedes-benz ml63 amg, bmw x5 m, porsche cayenne turbo and ford f-150 raptor. now, the edge st joins the crew. upgrades for production-set duty include a matte-finish vinyl wrap to reduce reflections on whatever's being filmed, a gutted interior with a roll cage, and structural roof supports plus air springs at each wheel to support pursuit systems' half-ton arm, which ends in a remote-controlled camera with gyroscopic stabilization. this enhanced edge marks pursuit systems' fifth type of passenger vehicle rigged for camera work. the company also has four types of open-wheeled vehicles, including a yamaha yxz and a pair of polaris rzr side-by-sides, plus a boat and electric kart. credits from its garage of retrofitted rides include filming work for "san andreas," "jurassic world: fallen kingdom," "independence day: resurgence" and multiple installments of the "transformers" and "fast and furious" franchises. you know, artsy stuff that wins the palme d'or at cannes. editor's note: this story was updated oct. 26, 2018, to reflect the number of vehicles outfitted by pursuit systems.